It was a case of keeping it in the family for the overall winners of the 2015 Ward Hadaway Fastest 50 Awards, Techflow Marine. Organised by law firm Ward Hadaway, with support from The Journal newspaper, the annual event seeks to highlight and celebrate the privately-owned and profit making companies and organisations in North East England that have shown the strongest annualised sales growth over recent years. From Left to Right: Techflow Marine Non-Executive Director Colin Fitzpatrick, Sales Director Ken Beattie & Directors Graham Clark & Jim Straker. Techflow Marine won the award for North East England’s fastest growing business for 2015, as well as being named the fastest growing large business in this region. 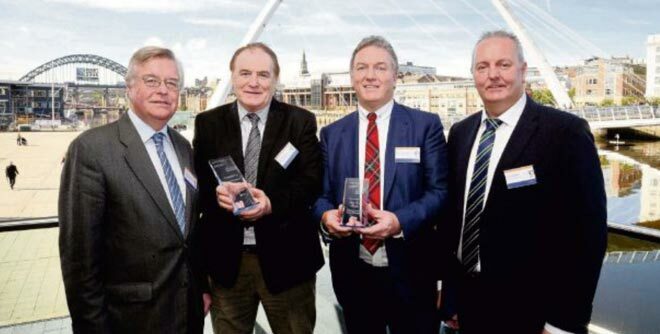 The offshore oil and gas and marine specialist followed in the footsteps of its sister company, Techflow Flexibles, which was named fastest growing large business in the 2014 Ward Hadaway Fastest 50, to make it a remarkable double triumph.